Nils Gustaf Dalén was a Swedish Nobel Laureate and industrialist, the founder of the AGA company and inventor of the AGA cooker and the Dalén light. Inventor of a sun valve, which operated as a switch to turn on a light during the hours of darkness. This invention was used extensively for buoys and lighthouses, almost immediately. Another invention of his was Agamassan, a substrate used to transport acetylene. He was chief engineer at Gas Accumulator Company (manufacturer and distributor of acetylene), and later rose into a management position. An accidental explosion blinded him in 1912. On his return to Sweden, Dalén carried out some research at Gothenburg and set up as a consulting engineer. He became Technical Chief of the Svenska Karbid- och Acetylen A.B. (Swedish Carbide and Acetylene, Ltd.) in 1901 and he later joined the Gas Accumulator Company where he became Chief Engineer in 1906. In 1909, the company was reorganized as Svenska Aktiebolaget Gasaccumulator (AGA) (Swedish Gas Accumulator Ltd.) with Dalén as Managing Director. Dalén's inventiveness first showed in his early days on his father's farm when he built a threshing machine powered by an old spinning wheel. He contrived a device to indicate the butterfat content of milk and thereby made his contact with de Laval. On completion of his advanced education, he worked on the construction of a hot-air turbine and related air compressors and pumps. He also invented a pasteurization apparatus and a milking machine. 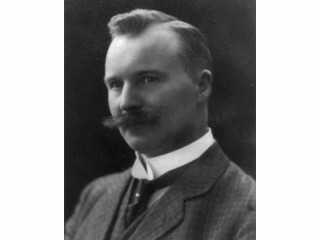 In 1901, Dalén's company purchased the patent rights of the French invention of dissolved acetylene and he began his work on automatic flashing beacons for lighthouses. His subsequent invention of the sun-valve, which causes a beacon to light automatically at dusk and extinguish itself at dawn, enabled lighthouses to function perfectly and unattended for periods of up to a year. His invention of cylinder filled with a porous mass of asbestos and diatomaceous earth for storage of acetylene reduced considerably the hazards in handling this material and its use in welding became safe. He also invented a mixer for providing a constant and correct balance of gas and air for use in the incandescent mantle and a device for removing broken mantles and replacing them by new ones. In 1912, whilst testing safety devices on cylinders of acetylene in an outdoor location, and when satisfactory safety precautions had been taken, a sudden explosion seriously injured Dalén and caused the loss of his eyesight. He recovered from his other injuries and overcoming his great incapacity, continued his researches. He was awarded the contract for lighting the Panama Canal and later turned to the field of thermal technics to invent a stove, now in universal use, which maintains cooking heat for 24 hours using only eight pounds of coal. Dalén's writings were few, but he left his mark in a practical way by the provision of light, and therefore safety, for the benefit of travellers by land, sea and air. Amongst the many distinctions conferred upon Dalén are membership of the Swedish Royal Academy of Sciences, 1913, and the Academy of Science and Engineering, 1919. He was made Honorary Doctor of Lund University in 1918 and received the Morehead Medal of the International Acetylene Association. He took part in debates at the National Society of Economics and served on the Lidingö City Council for almost twenty years. Dalén married Elma Persson in 1901. They had two sons and two daughters. Their eldest son, Gunnar, qualified as an engineer and followed his father as a Director of AGA; their younger son, Anders, became a Doctor of Medicine; Gustaf's brother Albin, a famous ophthalmologist, was a Professor at the Caroline Institute. Dalén died on December 9, 1937, in his villa at Lidingö. View the full website biography of Gustaf Dalen.